I’m wondering if this is happening in all areas of Michigan and am hoping that it is: the rising number of dog owners who are taking their faithful companion out for a walk every single day. I have noticed that the number seems to be increasing here in my neck of the woods, and I love it more than you know. Why? In my opinion, dogs are truly one of the best walking companions that you could ever wish to have. 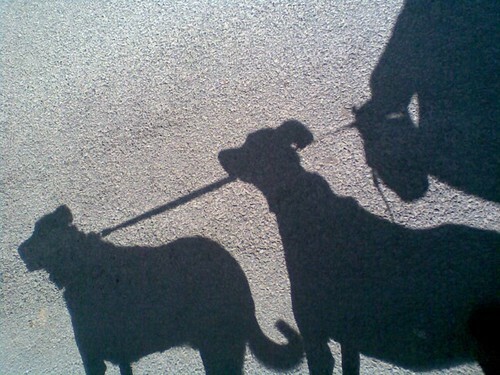 Most dogs are ready to walk any time of the day, for any distance and in any kind of weather. They don’t complain, they enjoy every step and often appear as though they don’t want their walk to end. If you are a dog owner, you know exactly what I mean! Owning a dog gives us just one more reason to walk daily since most canines become accustomed to this part of their daytime routine and refuse to allow a day to pass without taking one. Owners soon feel that this walk is more for the dog’s pleasure than it is for their own (hey, that’s okay with me… they are both reaping the benefits of better health no matter who is enjoying the walk more). Many of you may already know that my dog, Sierra, walked with me every step during my 162-pound weight loss. She not only enjoyed these daily 1.5-mile daily walks, but she became healthier with each step she took. Sierra lived to be 15½ years old, which was considered by her veterinarian a long life since she was a large breed dog. Today I walk with my two dogs, Izzy and Skyla, both of whom were adopted from our local Humane Society. They look forward to our daily walks just as much as I do… but I look forward to them even more since I recently learned of a study led by a Michigan State University researcher that shows people who owned and walked their dogs were 34 percent more likely to meet federal benchmarks on physical activity. Yay, I love that! Dog walking could help many Americans—of whom fewer than half meet recommended levels of leisure-time physical activity—become healthier. This study also showed that people who walked their dogs generally walked about an hour longer per week than people who owned dogs but did not walk them. The social aspect and human-animal bond of owning a dog have also been shown to have a positive impact on quality of life. I can’t agree with that more — I know my two dogs have a very positive impact on my life and with everyone in our family. I hope that the number of dog owners who strive to walk daily increases in all areas of our great state… it’s just one more step to A Healthier Michigan! Fellas, Are You Too ‘Manly’ to Walk With Your Wife or Girlfriend? Dogs help heal many wounds, why not reward them at the beach?